Previous articleThe Closing of the Conservative Mind? Mark Shiffman was born in north Florida to the son of expatriated New York secular Jews and the daughter of small town, pillar of the community southern Presbyterians. After spending much of his childhood in Alaska and California, he discovered in his Tennessee adolescence, first reluctantly and then gratefully, that more than half his heart belonged to the South. He occasionally rediscovers this viscerally when his body descends below the Mason-Dixon line from his northern exile in Philadelphia, where he has also brought his wife into exile from her lifelong home of Chicago. They live in the Mount Airy section of Philadelphia with their two sons, having moved from one of the more successfully racially integrated neighborhoods in America (Hyde Park) to one of the most. Mark received his education from the McCallie School in Chattanooga and the surrounding mountains and trees, St. John’s College in Annapolis and the Santa Fe desert, Pendle Hill outside Philadelphia and the woods around Crum Creek, the University of Chicago and the icy prairie winds, and the Catholic Worker House and grimy streets of New York City. 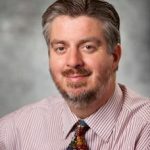 He is assistant professor in the Department of Humanities and Augustinian Traditions and affiliate faculty member in Classical Studies at Villanova University. He has also taught at Brooklyn College, Notre Dame, the University of Chicago and the University of Pennsylvania. His current projects include books on the political philosophy of Plutarch and on the meaning of modern individualism, as well as a translation of Aristotle’s On the Soul (Focus Press). I agree, strongly, with 75% of this. That a true conservatism is deeply concerned with community virtues, rather than individual rights, is not only true but should be obvious. That liberalism is founded upon an individualism is equally true, and obvious. But his claim that “the left” is individualist, the carrier of a radical individualism which begins with Rousseau and is carried over to Marx, is deeply, fundamentally wrong. I would grant the legitimacy of an interpretation which held the Rousseauian-Marxist (and don’t forget Hegelian!) “left,” if you want to use that term, as making the same modern presumptions about subjective individuality which modern liberalism does: that we all are fated, as far as we ourselves can ever know, to be independent deciders, rather than role-embracing followers, and hence that we cannot help but historically move against social bonds. I personally would demure from that interpretation, as I think the Rousseauian-Hegelian-Marxist left is (or at least can be) far more cognizant of the role of community in how we understand and evaluate our situation than that interpretation allows. But still, I would recognize it as completely plausible. But to say much more than that–to say, as Blond does, that the left (and Rousseau, and Marx) is itself individualist, in the full political sense–is, I think, to confuse post-Millian liberalism with the communitarian-socialist left so badly as to almost defy comprehension. Someone please come to Blond’s defense–or, conversely, tell me how I’ve totally misunderstood his point. I have to agree that the invocation of Rousseau in this vein was one of the points that jumped out at me as much too flat-footed in Blond’s narrative of individualism. In terms of metaphysics, Rousseau is certainly as much a nominalist as Locke, and so cannot but conceive the human being as naturally a non-participatory being; but psychologically (and Rousseau’s political thought is fundamentally psychological) we necessarily live outside ourselves insofar as we are not animalistic “natural man”, and Rousseau’s challenge is to articulate a way to shape our psychological interdependence in a way that conduces to freedom and happiness. The direction I would go is to argue that Tocqueville provides a better account of how to address the problem on Rousseau’s own terms. I think the central point is Blond’s analysis is that for Rousseau, it is society that corrupts what would otherwise be a free and natural man. What I don’t know, because I don’t know Rousseau well enough, is whether this is a feature of particular societies, or of society in general. If the first is the correct interpretation of Rousseau, then Blond might be misinterpreting Rousseau’s position in liberalism. If the second is correct, then Blond might have a point. “Corrupts” is perhaps not the clearest way to put it. For Rousseau, man is a historically emergent and malleable being. Prior to social existence, Rousseau depicts man as a solitary brute reacting to immediate physical needs. As he adopts stable dwellings and becomes a social being, man begins to grow aware of his existence in the opinions and estimations of others. In tribal life, this is not corrupting, because one is judged by obvious virtues about which there can be no mistake: physical strength, hunting skill, dancing, etc. Thus Rousseau calls tribal life the happiest state of humanity: happiness rests on satisfaction with one’s life, satisfaction depends on opinion of oneself that is mediated by others, “natural man” has no self-opinion (or self-esteem: “amour-propre”) and so is incapable of happiness, whereas tribal man has good self-opinion based on stature earned for real excellences. Corruption enters in when social life develops to the point where the opinion of others can be attained by frivolous marks of superiority and by projecting an image of oneself that has no foundation in a genuine ground of self-respect. The diversification and “privatization” of property, and disparity of wealth and power, has a lot to do with this. Rousseau looks to classical republics for clues to the solution. When citizens actively self-govern, exercising virtues clearly recognized as valuable to the city and as manifestations of personal self-command, they have a different stable ground of self-regard. Hence republicanism reveals that happiness in political conditions of social life can consist above all in self-governance or autonomy (= giving a law to oneself, in both the political and moral senses). Hence we get Rousseau’s political theory of the “general will” and Kant’s ethic of “respect for the law I give myself”. Rousseau is woolly on how and whether we can construct a social-political order that solves the problem. Hegel sees the advance of liberalism addressing it through achieving universal mutual recognition of right and dignity. Marx sees property relations as the key, and the “general will” solution is communist ownership. Tocqueville is the thinker in the Rousseauan current who recognizes that within larger-scale political orders it is still possible and necessary, through administrative decentralization, to sustain active self-governance. What is lacking in Tocqueville is thorough reflection on the economic aspect of the problem, and it seems to me that distributism fills this gap nicely. Tocqueville also has the advantage over the more system-crazed Germanic Rousseauans of an Augustinian sense of limits in all things human (a sensibility gained from long meditation on Pascal). All this takes Tocqueville in a direction less amenable to fascist and totalitarian appropriation of his thought, which is all too easy in Rousseau and the Germans. And as for Rousseau, IMO he’s one of the very hardest to pin down. Which of the theories he offers are thought experiments and which are not? A nasty man, to be sure; and had a number of destructive legacies. But I do roll my eyes when intellectuals of all stripes, but especially conservative ones, so predictably use him as a dog to kick around, always presenting him in these short-hand ways. Carl: Agreed on all counts. Incidentally, I’m working on a book on individualism that will devote a chapter to Rousseau, so I’m hoping to give a more careful account than I could here. It is in large part because he’s so open-ended that Rousseau has had such considerable and diverse legacies. Since some FPR writers are frequently accused of being agrarian romantics (which is one of the legacies of Rousseau), one thing that needs some clearing up is exactly how indebted or not the kind of agrarianism sometimes defended on this site is to Rousseauan forebears, and if not then what the decisive principles are that divide us from that current. For me what is great about Phillip Blond’s message is that he is telling people that what has been going wrong in society particularly over the last thirty years is that there has been too much Account of Rights but not enough Account of the Good, or more precisely the Common Good. He is telling the British and American people they have had the wrong type of conservatives in their Tory and Republican parties (and for that matter Labour and Democrat parties). These conservatives have been Libertarian conservatives focused predominantly on Rights. What he is arguing for is One Nation conservatives who consider both types of Account are core to their philosophy. This, of course, winds the clock back to some extent to the period of 1945 to 1979 (Margaret Thatcher’s election as Prime-minister). However, whilst I understand Phillip’s argument about Liberalism making every man and woman his own sovereign and the state forced to hold the ring and moral equivalence being the fall-out from this process I do think he overdoes the rhetoric by declaring that the seat of individualism lies with the left. I think it lies more generally across all spectrums of political opinion. Why, for example, should Phillip talk about the papacy being seized and transferred to Avignon if this wasn’t the act of a right wing plutocracy wishing to acquire the cloak of respectability for its marauding? That cloak of respectability stemmed from the fact the Papacy was engaged (sometimes nominally) in stressing the importance for human beings to pursue an Account of the Common Good. It can further be argued that the origin of plutocracy derives from the time, thirteen thousand years ago approximately, that hunter-gatherer societies turned to domestication of animals and crops in the Fertile Crescent and this encouraged the greater emphasis on an Account of Rights than an Account of Good since man was mixing his labor in Lockean and factional terms by tending animals and making the land productive. Prior to this the nomadic hunter-gatherer societies could pursue both Accounts through the process of collective bargaining. Whilst it was recognized that alpha males with the brute strength to protect the group from predators were useful they could also be free-riders by insisting on their own preferences (like killing other members of the group) causing tensions within the group. This could be kept in check, however, by the device of reverse dominance whereby weaker members of the group would gang up on the alpha male. Failing this tactic they would murderer the alpha male if he proved too sociopathic. Central to all this behavior was the innate if subconscious recognition that social cohesiveness was essential to the survival of the group and hence the transmission of genes. There has, therefore, always been the uneasy relationship within human society between the stronger and weaker members but the transition from the nomadic life-style to privatized command of nature permitted the stronger and perhaps more sociopathic members of society to become more Libertarian and place greater emphasis on Rights especially ownership rights. My point, therefore, is that the origins of individualism can be traced as much from the right as the left but the task for society is to now recognize this and see clearly that Phillip Blond’s dictum that we need to pursue both Accounts is the only way we can heal our societies’ dysfunctions. I feel the point of this argument. As David Schindler once put it, there’s a naturally “conservative” reading of Rousseau that would find Rousseau’s main ambition to point out that citizenship has become impossible in modernity and that, therefore, conditions where citizenship is possible (namely, as in the Greek Polis) ought to be restored. Carl Scott will immediately hear an apposition here with what he calls my “localist fundamentalism.” A charge, and an apposition, that is wrong, but it is going to take me months to write a the kind of substantial response necessary to show why (in brief, I don’t argue that the origin of law or legitimate authority is in the polis, but that the origin of politics is, and that natural law, whose origins are from above, teaches us that human nature is best fulfilled in a politics “from below,” or rather, one that emerges from human beings’ social nature . . . okay, that didn’t take as long as I thought it would, but explaining the consequences will take, again, months). No one objects, I presume, to the inclusion of Marx in Blond’s geneaology. Oh, I probably would. Again, as came out in the exchange between Mark and myself above, Marx (following Rousseau) is a nominalist, an ontological individualist, the same way Locke and other empiricists are, the same way the great majority of all post-Westphalian Western thinker of any note are. But to map such nominalism onto Marx’s subsequent accounts of alienation, property as social power, and class struggle, strikes me as, probably, both facile and tendentious. Blond seems to want to connect every collectivist argument he dislikes with the liberalism he also dislikes, and at anything except the most fundamental ontological level, I don’t think a connection like that can carry much weight at all. Thanks for the discussion. Rousseau is on that perfectly enormous list of Authors I Should Have Read, But Haven’t Gotten Around To It Yet. I only know Rousseau through critiques and readings in my politics course but as well as the philosophical similarities to liberalism that have been mentioned he does seem to share similar positions on his suspicion of what could be called intermediate associations like family or local community and even a support for a quite a large amount of individual autonomy. Like Robert Nisbet I do think that there is not necessarily a contradicition between this kind of individualism and collectivism. The difference is mostly in the role they place for the state or “collective” as a whole. Marxists will often tell you that there can be no conflict between a socialist collective, ie society, and individuals who make it up. In one sense this is very collectivist and contrary to the more normally “individualist” liberalism but it does share its hostility to intermediate institutions and its belief in high levels of personal autonomy free from these institutions, from customs and from any sort of moral restraint on non-violent behaviour. Btw when you say Post-Westphalian thinkers of any note Russell I hope you mean popular and not actual note or worth ;). It seems to me that the inability to see individualism as a key component in both Marx’s and Rousseau’s thought is the same line of reasoning that says that governments of the 20th Century simply “misappropriated” or “misunderstood” Marxist thought in attempting to accomplish their ends. I fail to comprehend how the inability to perceive anything more than individuals at the ontological level could not necessarily alter one’s thought when it comes to accounts of alienation, property, and class struggle. Indeed, Marx’s ontology can be seen in all three of the accounts that Mr. Fox highlights. What surprises me more is that none of the editors have yet commented on one of Blond’s last comments about the link that Blond thinks we are destined to live with, namely, that between a globalism on one hand and localism on the other. It was interesting to hear that Blond takes this as an assumption rather than a question, whereas at least my understanding of much that has been discussed here on the Porch, is that, going forward, the link between globalism and localism is most certainly a question. Further, Blond’s assumption of this link comes through even clearer when he discusses an example of how he perceives the interplay between the globalism and localism will work. He talks the language of a “self sustaining homestead,” but then cites Scandanavian islands that perform a very nuanced assembly portion of an overarching manufacturing process. This seems to be the very opposite of the “Shopcraft as Soulcraft” view. While I don’t perceive this as central to Blond’s work, I think it does present a problem for his earlier discussions about the localization of capital in order to fund the shops and processes that are necessary for the functioning of a local community. Yes, that’s right. Blond explicitly stated during his visit a) the ineluctability of globalization and b) his support for “empire rightly understood.” I’m on record against both these points, whether taken descriptively or prescriptively, i.e. globalization is nothing new and so does not, in its present manifestation, somehow oblige us to accept it in ways it has not in the past. And, per empire, I agree that if the choice is between a spirit of international world government and some kind of American or Western hegemony, then the latter is probably better in all kinds of ways — but neither sounds particularly good, if one can have instead the makings of real politics and real communities with juridical powers. I agree that this by no means makes Blond’s program un-amenable to a Front Porch one (if there were such a thing), I do think these points merit discussion more than his hermeneutics of liberal individualism from Rousseau to the present. I think it is clear at least from this essay that Rousseau wrote with such imprecision that it is difficult for anyone to determine how he would practically implement the mechanics of achieving an Account of the Common Good through the General Will. Kevin, great observation. I think that globalism is a passing fad, made possible by certain conditions that are now passing, the major one being cheap oil. When oil shot up to $140/bbl., the cost of shipping a container from Shanghai to LA went from $2,000 to $6,000, an amount high enough to wipe out both the wage and currency advantages of China. The firm of the future, will have the shortest supply and distribution channels, not the longest, and WalMart will become a dinosaur with an unworkable and expensive supply network. That being said, the distributive nature of manufacturing on the Scandinavian islands is good example. The suppliers need not be global to be efficient. The “globalism” is an incidental feature, the distribution and essential one. Or so it seems to me. As for the debate on Rousseau, let me state as one unqualified to hold an informed opinion that in the last analysis he is a contractarian, and therefore occupies the place in the liberal tradition that Milbank and Blond have given him. Further, his position on natural law is naturalistic rather than teleological, which makes him a paid-up member in good standing of the Enlightenment Philosopher’s Club. Mr. Medaille, (I apologize for not being able to do the accent). It would seem to me that the two are not only at odds with eachother (locally central foundations of capital investing in local companies would do well to invest in those companies that provided goods for the local community rather than the “global community”), but are also at odds with a sense of “place” that is emphasized here on the Porch as Mr. Wilson pointed out above. Further, while I agree with much of the ideas of the distributists, as does Blond, I think I would side with a program that emphasized the local over the foreign, even if that meant an economic regime that was “less distributed.” Maybe this is where we would disagree? Kevin (call me John–no accent required), I think we agree. The point is that enterprises can be distributed locally or regionally as well as globally. This is the model of Emilia-Romagna, where small firms within the region cooperate on big jobs. There is no reason why distributed manufacturing implies globalism. The same job can be spread across shops in the city, or the county, or the state. And if there really is expertise available only on Taiwan, then some can take place there as well. The “globalism” we see today is of low-value goods seeking starvation wages; we globalize production we could easily do locally. This is rather an innovation is long-distance trade, which was always confined to high-value goods that could not be reproduced locally. I don’t think it is a sustainable innovation. The trans-continental cabbage, grown in Oregon and consumed in Texas, also consumes more energy in its growth, harvest, packaging, transportation, and retailing then it provides. The only way that could be profitable is if energy were mis-priced or subsidies are involved. …” empire rightly understood”. Ahhhh, there’s the rub, the fleeting and erratic pleasures entailed in the search for the Enlightened Despot, be it of primogenitor or designed in committee. One suffers the entropy of closed gene pools and the other embraces the entropy of conventional wisdom. I think there is a proper understanding of empire, and that they are useful when they fulfill their proper roles. Successful empires arbitrate rights and privileges between various tribes and sects, and by monopolizing power at the center, prevent the tribal and ethnic warfare that is always the weakness of a pure tribalism. This is the exact opposite of democracies, which always exacerbate the tensions between groups as a way of ensuring electoral loyalty. It is no accident that peoples find a way to get along with each other under the rule of emperors (or even dictators) but fall to quarreling as soon as the empire weakens and to genocide as democracy triumphs. Yugoslavia under Tito was a peaceable kingdom, but fell to bitter battle under “democracy.” The various ethnic groups found a way to live under the Turks, but in the dying days the Armenians and others found themselves under attack, which turned under Ataturk and democracy into outright ethnic cleansing of the Greeks and genocide against the Armenians. The weakness is that there is always a central tribe that is “better” than the others, with more rights and privileges, which builds in tensions and sows the seeds of revolt and disorder. The Romans overcame this by extending citizenship beyond the Latin tribe and holding it out as a possibility for all men. This is likely due to the influence of the Christians. Democracy is not inherently peaceful. As a person who has been elected to public office five times, I can tell you that even for minor offices the best way of producing loyalty in your supporters is to exaggerate even small differences with your adversaries. I withdrew from politics not because I had to, but because I discovered that I was very, very good at it. Perhaps this isn’t so bad where the differences really are small, but where there are real and long-standing tensions, it can easily be the cause of political instability, war, and genocide. I always remember an Iraqi I once knew telling me that there was one virtue of the tyrant Saddam Hussein and that was he managed to keep the lid on the cesspit. I’m not so sure he was right in that Saddam Hussein couldn’t help but periodically agitate the contents of the cesspit because of his tribal loyalties. John, the problems with energy clear enough, I wonder if characterizing “Globalism” as a “passing fad” is not a little optimistic. The entrenched forces have not even begun to display the level of depravity possible in this species. Your comment on the currently demonstrable myth that “democracies are inherently peaceful” is spot on however. I suppose it all depends on what your definition of “passing fad” is. DW, I never think that anything is about to collapse until everybody says, “It’s here to stay!” “Globalism” depends on a vast series of externalized costs which are no longer possible. Indeed, merely adjusting the Yuan to its real value would collapse the WalMart model. But this support of the currency is a real drag on internal Chinese development. The profitable business of the future will have the shortest supply lines, not the longest, the most local distribution, not the widest. Of course there will be many exceptions to that rule, but the global model will no longer dominate. One thing the global model did, however, was advance the cause of distributism. That is, production is already distributed across a network of firms. Corporations now think that it is crass and vulgar to actually own a factory and to have to actually deal with real workers. So they divested themselves and distributed their production among a host of small firms, relying on patent protection and marketing/distribution to maintain control. But someday soon, that will break down. The small factories making Nike’s will discover that instead of competing for the thinnest margins possible, they can just say, “the patent be damned,” rip of the swooshtika, and sell the shoes locally for a tenth of the price while paying their workers three times the amount and making twice the profit. That will be the end of globalism, and the Chinese have already caught on to this.